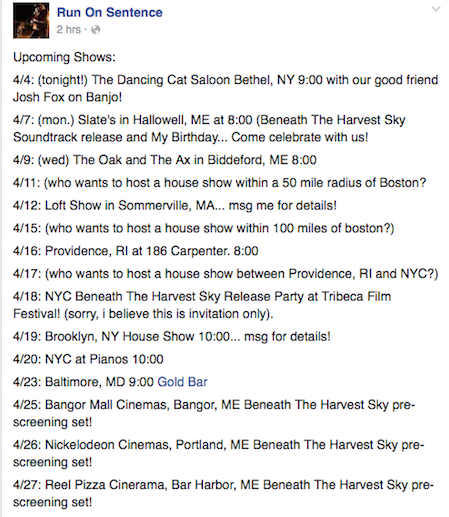 I was so happy to hear that Dustin Hamann would be in town to play some shows surrounding the release of the soundtrack he scored for just-released Beneath the Harvest Sky, a film made in Van Buren (that’s nearly Canada, folks) by Maine-native Aron Gaudet and Gita Pullapilly. They are responsible for the very moving film The Way We Get By, which connects the lives and struggles of three elderly troop greeters at the Bangor International Airport. I grew up in Bangor and greeted the troops regularly at odd hours when I was in elementary and middle school, and I’m thrilled that lovely film was made so well and was so well received. Check out this feature about filmmakers in Maine including Aron and Gita in April’s Maine Magazine. 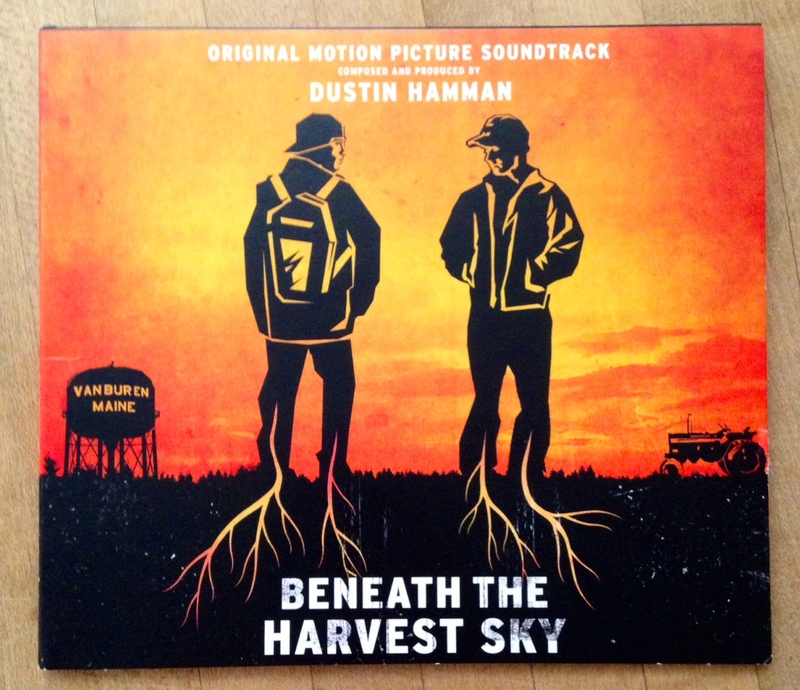 Beneath the Harvest Sky seems dark and suspenseful compared to The Way We Get By and I don’t think of Dustin’s music as dark, so I’ll be interested to see how the two go together. There are many screenings of Beneath the Harvest Sky planned this week throughout Maine and Dustin is playing before some of them. If you’re able to get out to see him, you will be glad you did. He is really special. Dustin is the driving force behind Run On Sentence and writes powerful, captivating music. 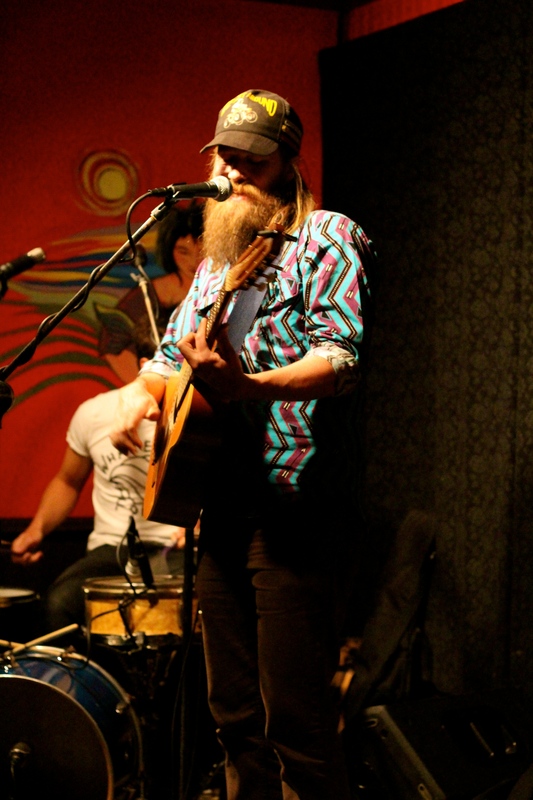 The first time I ever saw him play (thanks to the suggestion of Mark Wethli) was late summer 2010. I was moved by the music—so much so that I went to see him play again the very next night. 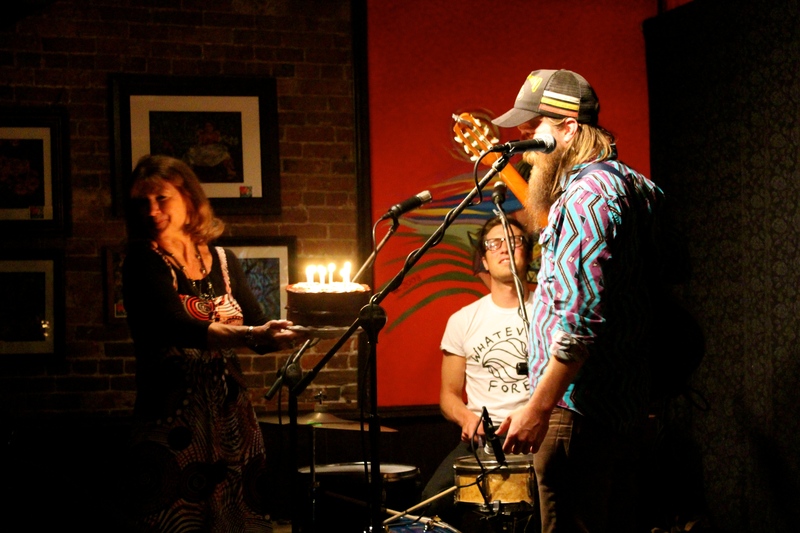 It had been a year and a half since the last time I got to see Dustin play in 2012 (here’s that post), so I was thrilled to see that he would be just down the road from me at Slates in Hallowell to celebrate his birthday and the release of the soundtrack he wrote for the film. I was excited to see Mark and Cassie at the show, too, and in the soundtrack liner notes, Dustin said he first really started the real work writing the soundtrack at Cassie and Mark’s place in Brunswick after leaving the film shoot in Van Buren. 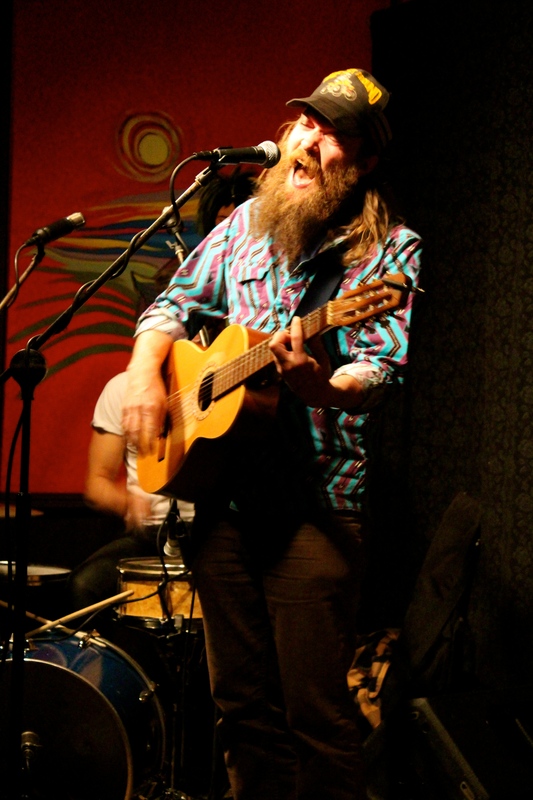 Dan Galucki, who grew up in the area and went to Hall Dale High School in Hallowell, is Dustin’s Run On Sentence band mate and was able to play this hometown show, as well. 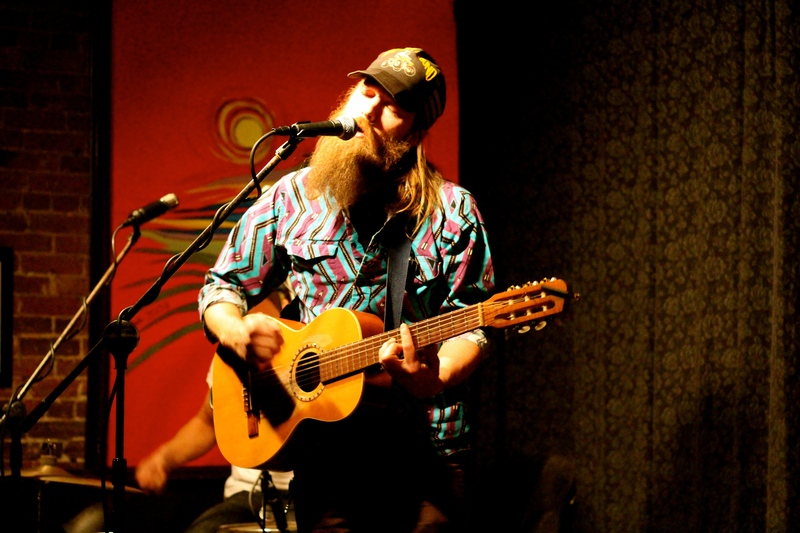 Music enthusiast Lucky Clark interviewed Dan for the Kennebec Journal before the show. It was great to hear them play together and hear the fullness of sound they were able to create on the soundtrack for the film. I was glad that Dustin and Dan played some older Run On Sentence songs from You The Darkness And Me like “Water,” “These Hills,” and “Out In the Woods.” We didn’t hear my favorite ROS song, “I Am The Blood” that night, but I really hope you’ll take a listen to it. 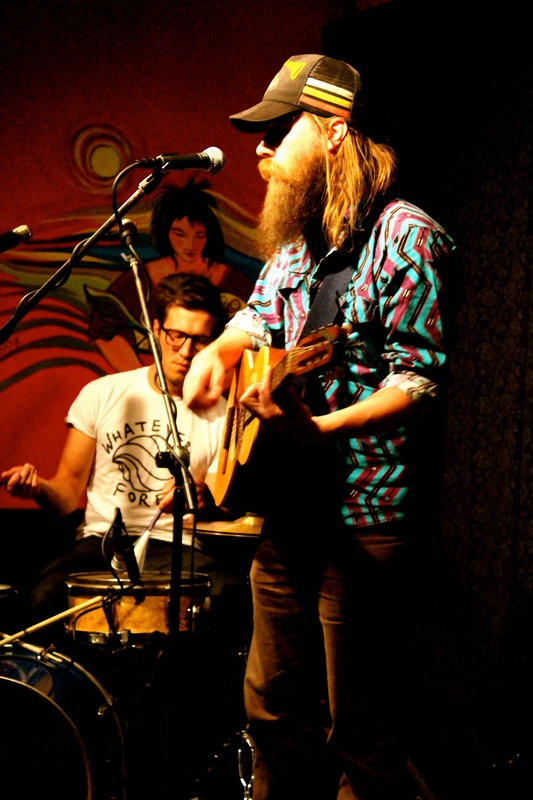 Dustin’s lyrics are meaningful and his voice is raw and intense. He also plays a mean mouth trumpet. 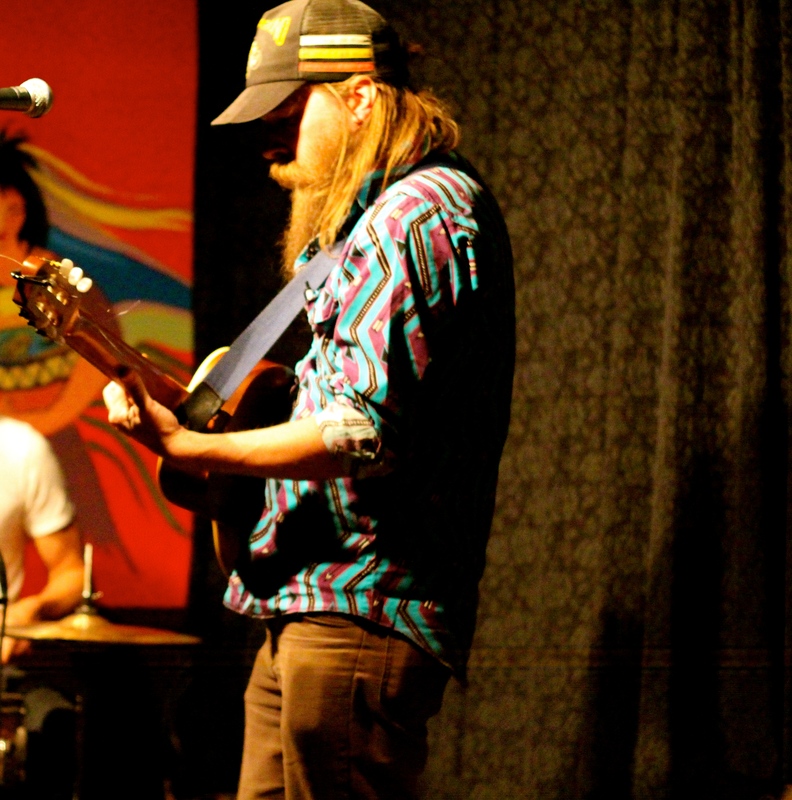 Dustin and Dan both appear in the film and lived in Van Buren for a couple of months working on writing music while it was filming. Dustin gave me a copy of the 21-song soundtrack it’s a mix of Run On Sentence songs, Dustin solo, and ambient guitar/percussion pieces. Listening to it a few times made me even more eager to see the film. 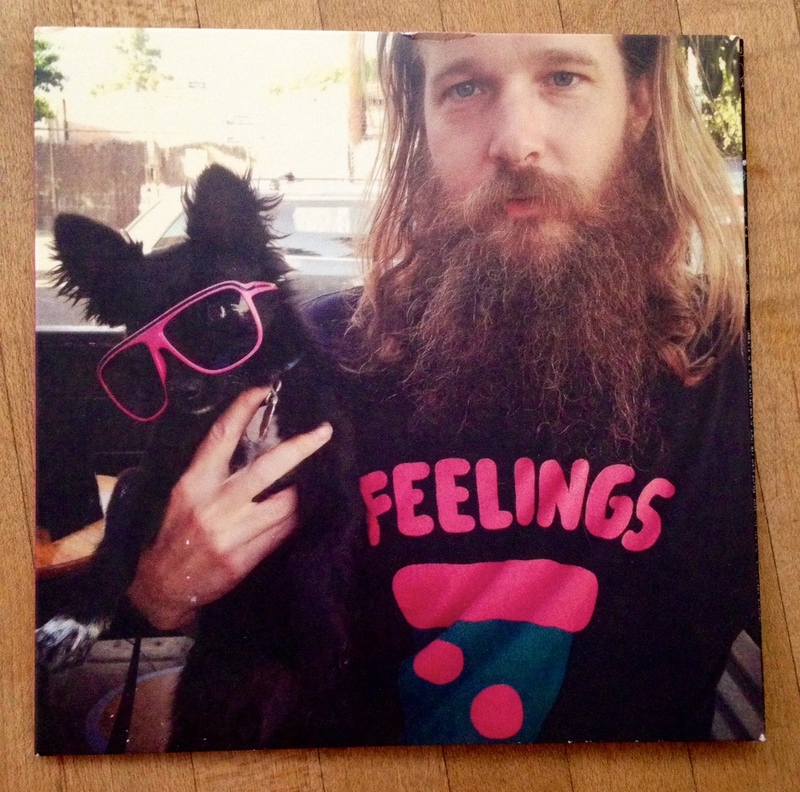 “Stonewall” shows up on the soundtrack and on Dustin’s newest release, Feelings. He said it was about a guy who wouldn’t stop sleeping on his couch so he had to kick him out. It’s a standout song—true to ROS because of it’s varying tempo and intensity—but special because of Dustin’s surprising hearty rounds of “HA HA HAs” in the song. “Run To You” is surely a favorite on both albums, as well. I particular like the lyrics “And I wonder now and then/If I could do this all again/Would I just lie and watch the wind blow through the grass/Instead of trying to find the words to make it last/Cause I can never quite convey/All the things I mean to say/My words are arrows taking aim upon the truth/That’s all I’ve got/I guess the rest is up to you.” I grabbed a copy of Feelings on my way out because I want to keep a complete ROS hard copy discography on hand. Dustin’s dog, Frankie, an adorable Papillon/Chihuahua mix, is featured on the cover. Dustin told us that Aron and Gita had invited him to write the soundtrack for Beneath the Harvest Sky because of his song “Wide Open Sky” (which is on the soundtrack), which he played while we sang along. He took out his three string cigar box guitar “Li’l Red” for a song or two, and used a piece from a socket wrench as a slide. 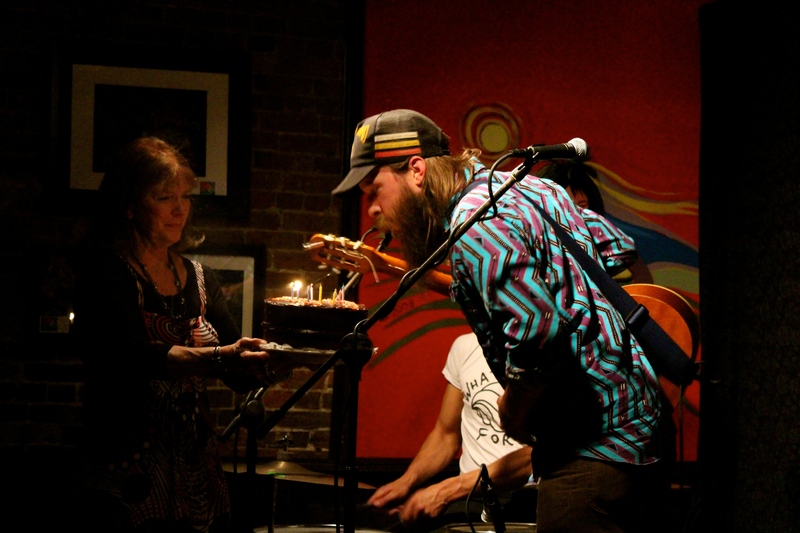 Dustin’s mom sent a birthday cake for him, so we paused the show and sang him “Happy Birthday.” He asked us (as his birthday gift) to sing loud on “Stoned, Drunk, and Blind.” It’s a great song for a sing along and a perfect way to wrap a Monday night. So glad to see you again, Dustin and Dan! Come back soon!